This is a panorama of the Milky Way over Boulder Beach in Acadia National Park during a night sky workshop that I co-instructed with Vincent Lawrence of Acadia Images Photography Workshops. I set my tripod in a natural bowl in the boulders on the beach and shot two spheres: one exposed for the sky and one exposed for the ground and refocused on the boulders. I blended the images together in Photoshop first via masks, then stitched them with PTGui Pro. I left the tripod in the nadir to show what a properly calibrated nodal slide should look like after stitching; it should be a smooth circle with no sawtooths. In fact, I hardly needed any control points at all in PTGui as it was already nearly perfectly aligned before stitching. I waited until the Big Dipper was outlined by the trees in the opposite direction of the Milky Way’s arch before shooting the panorama. Learn about this and more at our upcoming Night Sky Panoramas Workshop, May 5-8, 2016! Camera settings: 14mm, f/2.8, ISO 6400, 20 seconds, 3786°K for the sky and 14mm, f/2.8, ISO 3200, 120 seconds, 4024°K for the ground. Stitching data: 2 rows of 6 columns x 2 exposures for a total of 24 photos. Finished panorama is 18192 x 9096 or ~165 megapixels. Equipment used: Nikon D810, Nikon 14-24mm f/2.8, Promote Control, and Really Right Stuff TVC-34L tripod w/ leveling base & multi-row panning head. Long exposure noise reduction via Pixel Fixer. 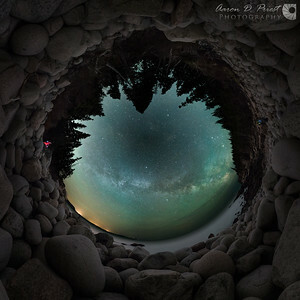 Above is a ~220° fisheye view of the sky, rendered with PTGui from the same spherical panorama. 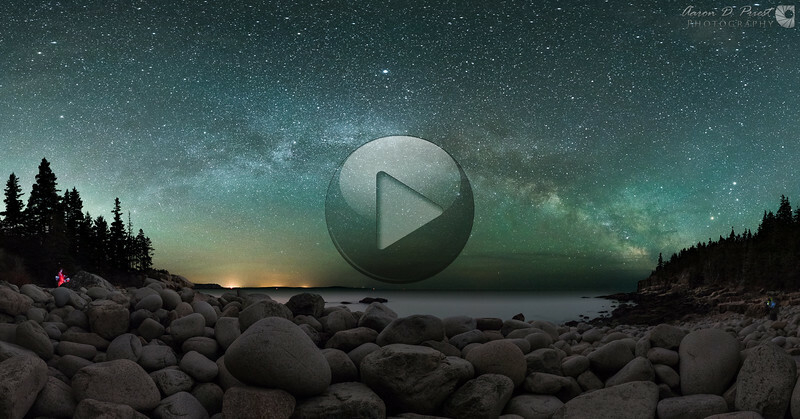 May 16, 2015, 12:29 – 01:16 AM This is a crop of a spherical panorama that I shot of the Milky Way over Boulder Beach in Acadia National Park during a night sky workshop that I co-instructed with Vincent Lawrence of Acadia Images Photography Workshops. I set my tripod in a natural bowl in the boulders on the beach and shot two spheres: one exposed for the sky and one exposed for the ground and refocused on the boulders. I blended the images together in Photoshop first via masks, then stitched them with PTGui Pro. I left the tripod in the nadir to show what a properly calibrated nodal slide should look like after stitching; it should be a smooth circle with no sawtooths. In fact, I hardly needed any control points at all in PTGui as it was already nearly perfectly aligned before stitching. I waited until the Big Dipper was outlined by the trees in the opposite direction of the Milky Way’s arch before shooting the panorama. Learn about this and more at our upcoming Night Sky Panoramas Workshop, May 5-8, 2016! Details here: http://galleries.aaronpriestphoto.com/Workshops/2016MayPanoramaWorkshop Camera settings: 14mm, f/2.8, ISO 6400, 20 seconds, 3786°K for the sky and 14mm, f/2.8, ISO 3200, 120 seconds, 4024°K for the ground. Stitching data: 2 rows of 6 columns x 2 exposures for a total of 24 photos. Finished panorama is 18192 x 9096 or ~165 megapixels. Equipment used: Nikon D810, Nikon 14-24mm f/2.8, Promote Control, and Really Right Stuff TVC-34L tripod w/ leveling base & multi-row panning head. Long exposure noise reduction via Pixel Fixer. 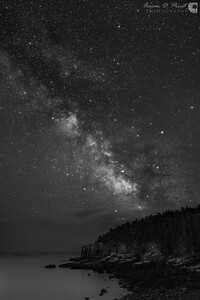 May 16, 2015, 12:29 – 01:16 AM This is a ~220° fisheye view of the Milky Way over Boulder Beach in Acadia National Park during a night sky workshop that I co-instructed with Vincent Lawrence of Acadia Images Photography Workshops. I set my tripod in a natural bowl in the boulders on the beach and shot two spheres: one exposed for the sky and one exposed for the ground and refocused on the boulders. I blended the images together in Photoshop first via masks, then stitched them with PTGui Pro. I left the tripod in the nadir to show what a properly calibrated nodal slide should look like after stitching; it should be a smooth circle with no sawtooths. In fact, I hardly needed any control points at all in PTGui as it was already nearly perfectly aligned before stitching. I waited until the Big Dipper was outlined by the trees in the opposite direction of the Milky Way’s arch before shooting the panorama. Learn about this and more at our upcoming Night Sky Panoramas Workshop, May 5-8, 2016! Details here: http://galleries.aaronpriestphoto.com/Workshops/2016MayPanoramaWorkshop Camera settings: 14mm, f/2.8, ISO 6400, 20 seconds, 3786°K for the sky and 14mm, f/2.8, ISO 3200, 120 seconds, 4024°K for the ground. Stitching data: 2 rows of 6 columns x 2 exposures for a total of 24 photos. Finished panorama is 18192 x 9096 or ~165 megapixels. Equipment used: Nikon D810, Nikon 14-24mm f/2.8, Promote Control, and Really Right Stuff TVC-34L tripod w/ leveling base & multi-row panning head. Long exposure noise reduction via Pixel Fixer.